Da Capo Press, 9780738211664, 344pp. 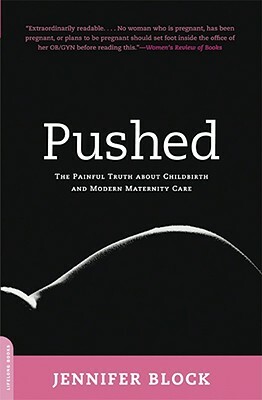 A groundbreaking narrative investigation of childbirth in the age of machines, malpractice, and managed care, Pushed presents the complete picture of maternity care in America. From inside the operating room of a hospital with a 44% Cesarean rate to the living room floor of a woman who gives birth with an illegal midwife, Block exposes a system in which few women have an optimal experience. Pushed surveys the public health impact of routine labor inductions, C-sections, and epidurals, but also examines childbirth as a women's rights issue: Do women even have the right to choose a normal birth? Is that right being upheld? A wake-up call for our times, Block's gripping research reveals that while emergency obstetric care is essential, we are overusing medical technology at the expense of maternal and infant health. Jennifer Block is a former editor at Ms. Magazine and an editor of the revised Our Bodies, Ourselves. Her work has appeared in The Nation, Mother Jones, and Elle. She lives in Brooklyn, New York.